← What brings you back to life? I am painting a photo of our first horse Kal. He is lying with his head on his forelegs, curled in a c-curve… embryonic…cradled. A photo of the image has been on my wall for the past few years since he passed away. 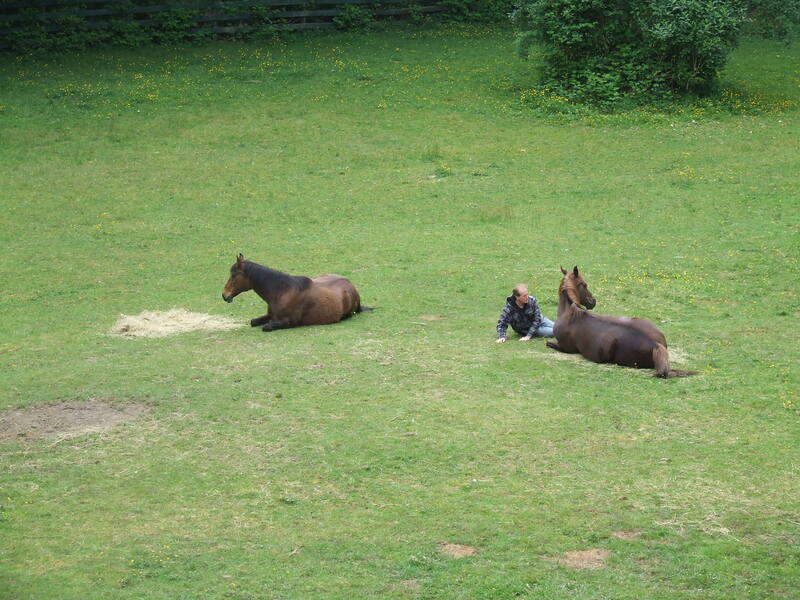 The photo was taken one day while he rested in the field. When I shared it with people they always remarked how rare it is to see a horse actually lay their head down in such a way. Horses are prey animals, meaning they are always on alert and need each other in the herd to watch for predators if they are to feel safe and truly take rest. I would watch over the land while Kal rested, as he did not have another horse in the field with him at that time. As I paint the image I can feel the gift and embodied experience of my time with him. As much as I held watch while Kal rested, he was actually the one who taught me how to deeply rest, how to lye down in the green meadow and give my weight to the great mother of us all. Some warm summer days, after he was resting for a time, I would lye behind his thousand pound body, asking silently for him to transmit the possibility of that much surrender to gravity. 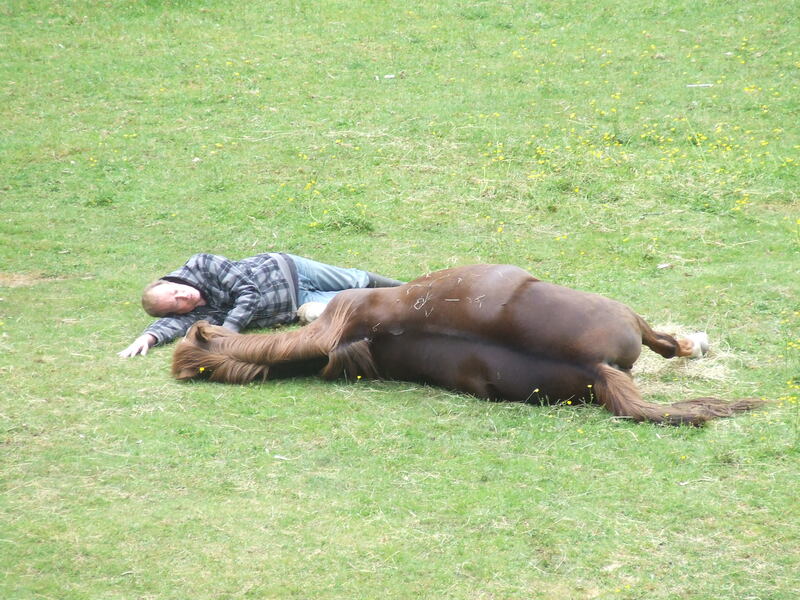 John would tell me to be careful, and that he might roll over onto me if I got too close. One day I moved in back to back with him, breathed by the same breath, together held in the embrace of she. Kal was even-tempered, gentle of spirit and a great first horse for me to get to know, and to be with in subtle and profound ways. Dancer came into our life the year before Kal passed. We wanted a companion for Kal as the winter’s chill was getting a bit much for his old bones, and we thought another warm body beside him, and a friend in the field, would do his heart good as he entered his 28th year. Dancer is Arabian, head strong and firey. We did not know what we were getting into when we said yes to this big-bodied spirit. His nervous system ran high, he jumped at small sounds, startled at the branches moved by the wind. He came with a leg injury and did not know how to let down and rest like Kal. 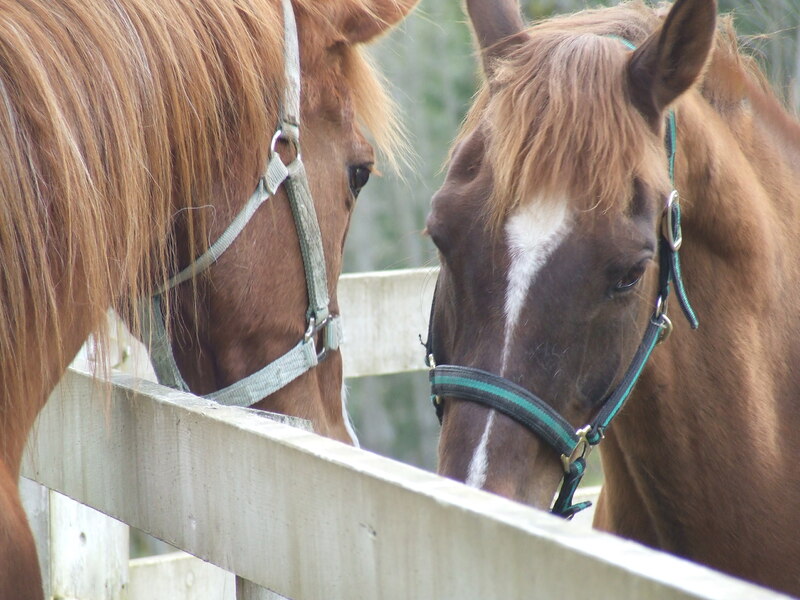 They met over the fence and Kal, (left) clearly through his gaze, let Dancer (right) know who was in charge. My tenant said it was like having Adam Sandler and Walter Matthauin the field, when she witnessed the two of them together the first day. Kal curiously watched, one eyebrow bent, as Dancer ran and raced about, snorting and fussing, spooking and startling his way into over extending himself and then limping around for the rest of the afternoon. After Kal passed away the following year, Dancer was difficult to settle. I knew he missed his friend and that now he oriented to me when I was in the field. One particularly difficult day for his sore leg I kept encouraging him to lay down and rest. After a while of him not taking my verbal advice, I decided to lay down and rest myself. I heard him moving and then opened my eyes to see him limping towards me. He then knelt down beside me and rolled onto his side, exhaled like he hadn’t been on the ground in a long time, and we laid there together in the sun’s embrace. Shortly after, Cocoa, a new horse who had arrived for retirement here in Paradise, also walked across the field, and to my amazement laid down on the other side of me. I was stunned and awed by the moment, lying between these two huge beings. We all rested together for quite some time.It was one of those moments not captured in image to share, but captured in a deep felt sense of transmission, one being to another. 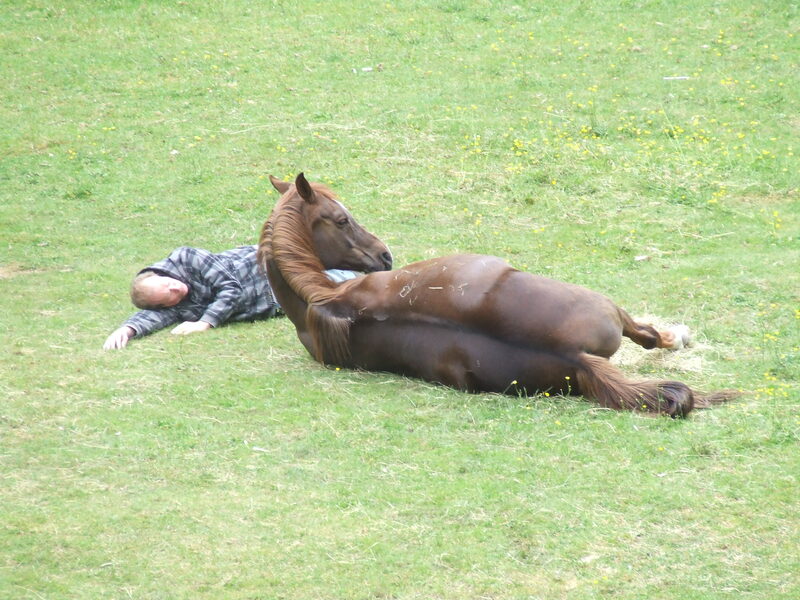 I shared with John and others of my experience laying with the horses. Some were hardly able to believe what had happened. Others would well up with tears in the embodied imagination, touched by the grace of the experience. 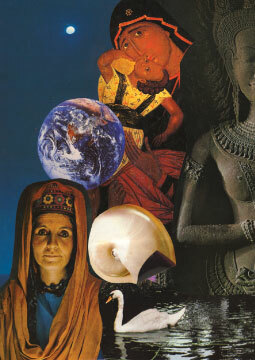 To this day the memory of the experience feeds me in moments of disorientation and dis-ease. 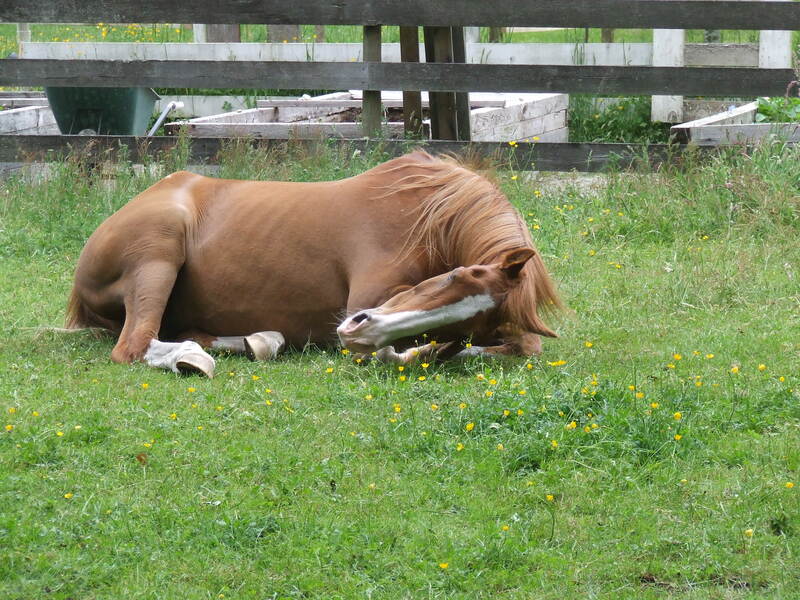 This past summer I looked out to see Dancer lying in the middle of his pile of hay in an awkward position. I was concerned something was wrong with his leg and called john, who was nearby. John slowly walked down to the lower field. I watched as he attuned to Dancer and slowed his pace. He knelt by Dancer’s head and the two of them held each others’ gaze for a time. 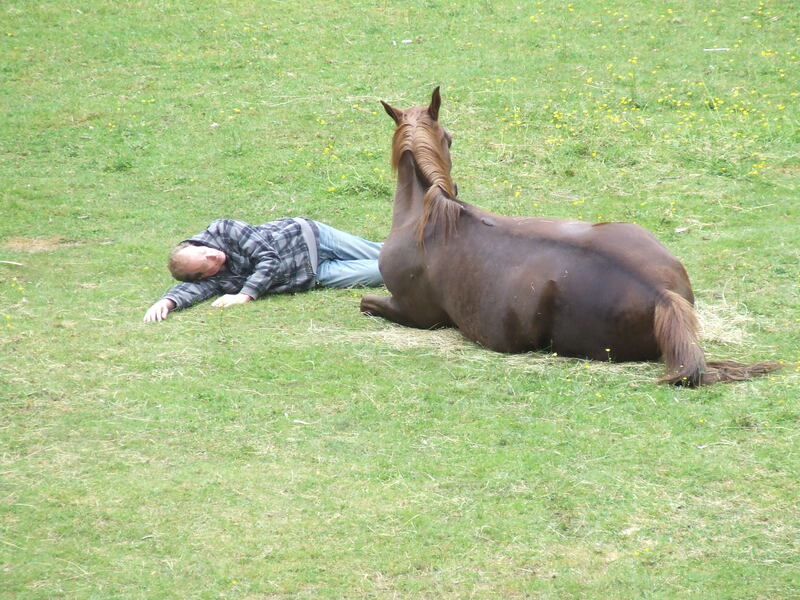 Then, john began to roll down slowly onto his outstretched arm and rest onto his side. Dancer followed, allowing the full weight of his head and body to release down onto the earth. I stood on the deck in the field of their embrace, stilled by the beauty and potency of what was before me. This image shows Dancer reaching his hoof out and resting it against John’s leg as they both closed their eyes and rested together.